Nikki Haley, South Carolina Governor, Selected As Trump's U.N. Ambassador : The Two-Way Haley has accepted an offer from President-elect Donald Trump to lead the U.S. delegation to the United Nations. The position requires Senate confirmation. South Carolina Gov. Nikki Haley is seen through drapes while speaking at the Federalist Society's National Lawyers Convention on Nov. 18 in Washington, D.C.
Haley "has very little foreign policy experience," NPR's Domenico Montanaro said on Morning Edition, noting that previous U.N. ambassadors have had extensive backgrounds in foreign policy or diplomacy. "It's going to be a steep learning curve off the bat." She is the first woman and first minority named as Trump's choice for a top administration official. "This month's elections have brought exciting changes to America. 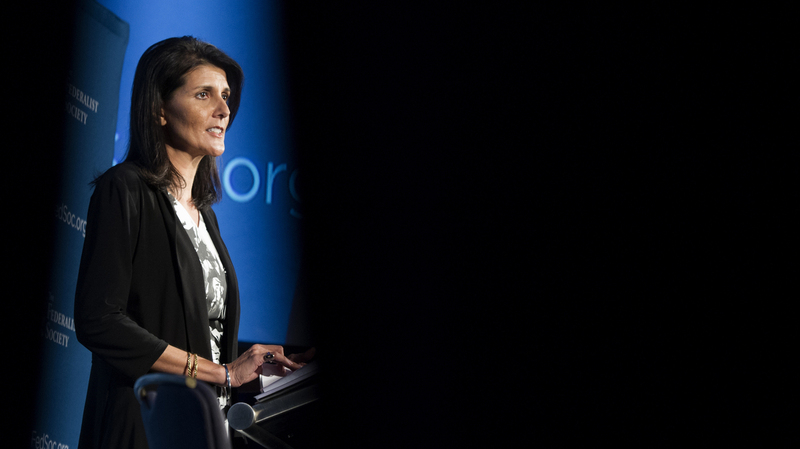 Our country faces enormous challenges here at home and internationally," Haley said in a statement. She said she had always expected to finish the remaining two years in her second term as governor, but that she felt a "sense of duty" that drove her to accept Trump's offer. "When the President believes you have a major contribution to make to the welfare of our nation, and to our nation's standing in the world, that is a calling that is important to heed," she said in the statement. The daughter of Indian immigrants, Haley was a Tea Party star before rising to prominence within the GOP. "Haley was a little-known state representative when she ran for governor in 2010, successfully taking on several establishment Republicans," NPR's Sarah McCammon reported in January. "She became the first woman and the first minority to lead the state. And she's currently the youngest sitting governor in the country." There were a number of crises during her first term as South Carolina's governor, as Sarah and NPR's Jessica Taylor reported: "Numerous children who were under the care of that state's Department of Social Services died and ... a massive data breach of the state Department of Revenue allowed hackers to steal many residents' private information. Her approval ratings dipped during her first term in the aftermath of those controversies, but they rebounded and she handily won re-election in 2014." Haley earned praise and a spot in the national spotlight for helping bring down the Confederate battle flag from the grounds of the South Carolina State House in 2015, in the wake of the mass shooting at Mother Emanuel AME Church in Charleston. In her State of the Union response earlier this year, Haley — who strongly opposed Trump's proposal during the campaign to temporarily ban the immigration of Muslims — criticized the "angriest voices" in the Republican party, later clarifying that she had Trump in mind. Haley supported Marco Rubio during the Republican primary — at one point, she spoke at a Rubio event and said, "Donald Trump is everything I taught my children not to do in kindergarten." Haley only tepidly endorsed Trump after he won the primary. Her history as a Trump critic is a contrast to that of the choices so far for other top administration posts — all of which have so far been filled with steadfast Trump supporters. Trump has previously named Reince Priebus as chief of staff, Stephen K. Bannon as chief strategist and senior counselor, Michael Flynn as national security adviser, Sen. Jeff Sessions as U.S. attorney general and Rep. Mike Pompeo as CIA director. "It does start to sound like a bit of a team of rivals," Domenico said. "I think it also tells you that Donald Trump doesn't have many connections to a lot of these leaders — he doesn't have a whole team he'd be bringing on board ... and a lot of that is because he just doesn't have the connections in Washington."